While Easter isn’t as popular a subject in cartoons as that other big Christian holiday, it does get featured occasionally. So, here’s a look at several Easter cartoons. 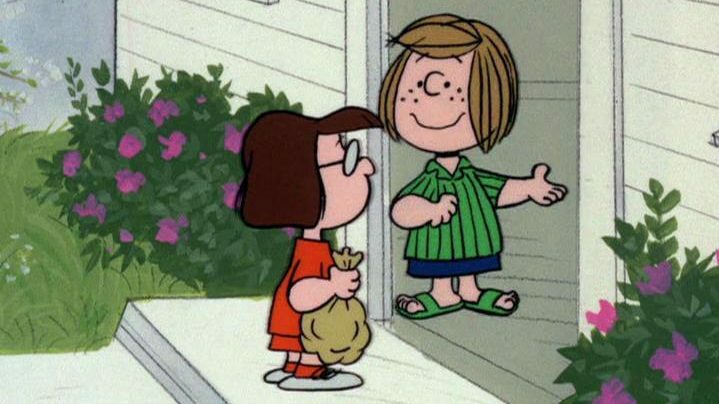 Peppermint Patty trying (and failing) to teach Marcie (who apparently can’t cook) how to dye Easter eggs (yep, the special passes the Bechdel Test). Snoopy buying Woodstock a birdhouse, which Woodstock decks out in groovy 70s decor. The department store the gang shop at is already selling Christmas stuff. Finally, Sally still holds a grudge against Linus over the “Great Pumpkin” no-show at Halloween (from “It’s the Great Pumpkin, Charlie Brown“). The special’s rerun every year on ABC around Easter. It’s also available on several “Peanuts” DVD releases. One is a single-disc release, paired with 1976’s “It’s Arbor Day, Charlie Brown” (presumably selected for being another springtime special; and yes, Arbor Day is the oddest choice yet for a holiday special). Another is the “Peanuts: 1970s collection, volume 1” DVD box set. The 1947 Bugs Bunny short “Easter Yeggs” sees Bugs help the Easter Bunny (called “Easter Rabbit” for some reason here) deliver his eggs. However, Bugs doesn’t know that the Easter Rabbit gets “some dumb bunny” to deliver his eggs for him each year. Bugs ends up dealing with some obnoxious brat (“IwannaEasteregg! I wannaEasteregg! I wannaEasteregg!”) and his apparently-mobster family. He also faces Elmer Fudd, who plans to shoot the Easter Rabbit and make “Easter Wabbit Stew!” (yes, Elmer plans to do in the secular symbol of Easter just for his “wabbit”-hunting obsession). Pretty amusing short; it’s available on the “Looney Tunes Golden Collection” volume 3 DVD set. There’s also been two Looney Tunes Easter specials produced. The first was a 1977 Easter special (“Bugs Bunny’s Easter Special,” or “Bugs Bunny’s Easter Funnies” on its single-disc DVD release). It features the Easter Bunny (here not a lazy deadbeat) calling Granny to tell her he’s sick and needs a replacement. Granny tries to recruit Bugs, who’s at the Warner Bros. studios “filming” several of his classic shorts (cuing a bunch of old clips). “The Yolk’s On You”: Daffy and Sylvester fight over a golden egg. “Daffy Flies North”: Daffy tries to find a shortcut to migrating south for the winter. “The Chocolate Chase”: Daffy the chocolate candy factory guard tries to keep out Speedy Gonzales. The shorts here have been mostly mixed in with the Looney Tunes TV packages since 1980. The special itself is available on the “Golden Collection” volume 6 DVD set as a bonus feature. The 1971 Rankin-Bass special marks one of their few holiday special forays away from Christmas, as we see the eponymous song turned into a hour-long special. Here, Peter (voiced by Casey Kasem) is an irresponsible but earnest young rabbit who’s forced to travel through time to save the holiday and win the chance to become the new Easter Bunny. Peter also must defeat the special’s villain, Irontail (voiced by Vincent Price). A fun special. Irontail certainly ranks up there with Rankin-Bass’ best Christmas-themed villains. Being Rankin-Bass, Santa puts in an appearance here for the Christmas portion, of course. The models for Santa and his reindeer seem to be the same ones from the then-recent “Santa Claus is Comin’ to Town” Christmas special. A direct-to-DVD sequel (confusingly named “Here Comes Peter Cottontail: The Movie”) came out in 2006. Here, it’s Peter’s son who helps save the holiday from Irontail (back for another go, this time with Jack Frost’s evil sister “Jackie Frost” in tow). Both specials are available on stand-alone single-disc DVD releases. In 1977, Rankin-Bass made this stop-motion animated Easter special, just a year after producing a half-hour all-traditional-animated (“The First Easter Rabbit”). Fred Astaire’s mailman character from “Santa Claus is Comin’ to Town” returns, now performing mail delivery for the Easter Bunny. The special tells the origin of the Easter Bunny (unrelated to Peter Cottontail, apparently); it also tells how various secular Easter traditions came to be. This special’s available on DVD. This 1994 special was the last major TV production to date starring Yogi Bear. (A Scooby Doo special produced later in 1994, “Arabian Nights,” does star Yogi in one segment.) Here, Yogi and Boo-Boo seek the Easter Bunny to save the holiday for Jellystone Park. This special’s available on DVD, sometimes paired with one of the above Rankin-Bass specials.